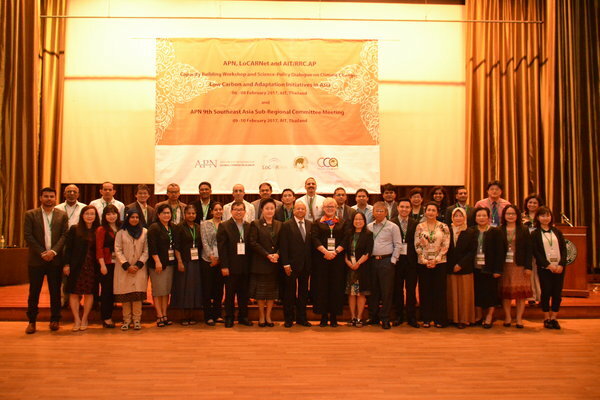 On 6-8 February 2017, the Asia-Pacific Network for Global Change Research (APN), the Low Carbon Asia Research Network (LoCARNet), the Regional Resource Centre for Asia and the Pacific, Asian Institute of Technology (AIT/RRC.AP) and the Climate Change Asia (CCA) Initiative co-organized a Capacity Building Workshop and Science-Policy Dialogue at the AIT campus in Pathum Thani, Thailand. The activities were driven by the common aim to strengthen the global response to climate change and to celebrate four years of support for low carbon development by both APN and LoCARNet. The three-day activities shared and discussed results from LoCARNet projects and activities, APN’s funded projects under its Low Carbon Initiatives (LCI) Framework and Climate Adaptation Framework (CAF), and the latest outcomes from partner organizations that support the implementation of the Paris Agreement. On the second day of the workshop, Prof. Rizaldi Boer represented CCROM SEAP as one of the main speakers in the dialogue entitled “Rapid talk: Low carbon infrastructure investment—the case of Indonesia”.